This pizza is a beautiful sight and would you believe it tastes better than it looks?! 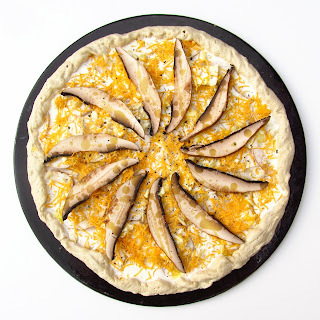 I've seen lots of tedious recipes for potato pizza that involve soaking potatoes in multiple changes of water or precooking them or making the white sauce separately. 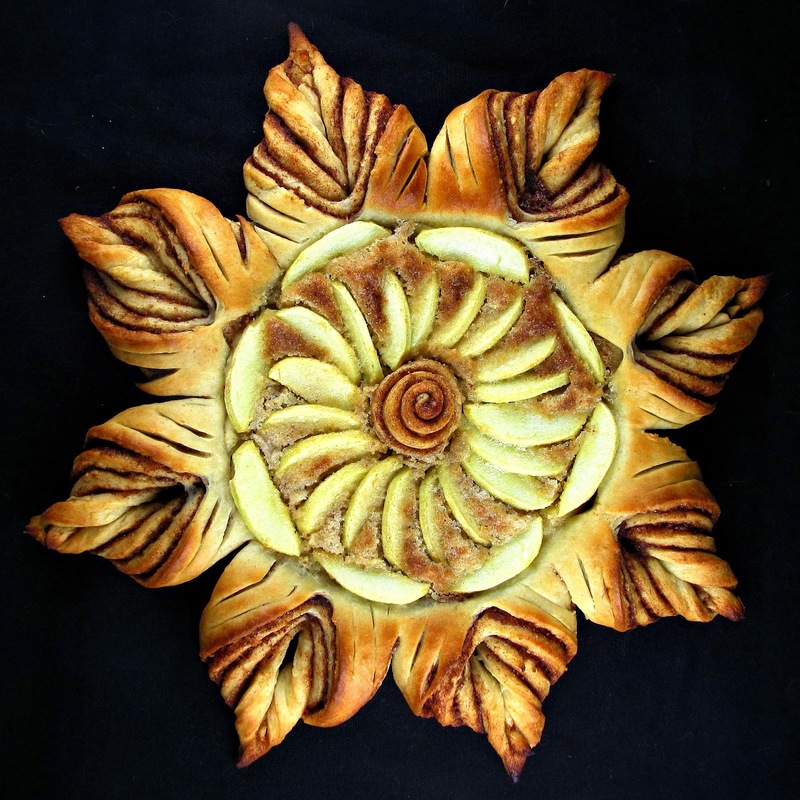 You won't believe how easy this recipe is (none of the above) and the outcome is both pretty and impressively tasty. I also like how this recipe begs for subtle variation in flavors- about a million come to mind! Mix together 2 tablespoons active dry yeast, 1 teaspoon sugar and 3/4 cup warm water in a medium bowl. Let it rest several minutes until foamy. Add a half teaspoon of salt, one tablespoon oil and up to 2 cups of bread flour, one half cup at a time, and mix with a wooden spoon until the dough pulls together in a wad around the spoon. Turn it onto a well-floured counter, sprinkle the dough with flour and knead for several minutes or until the dough is smooth and not sticking badly to clean hands as you knead (add sprinkles of flour as you knead until the stickiness subsides). Place the dough in a lightly oiled bowl and cover with greased plastic wrap. Place in the refrigerator overnight or do this in the morning and leave it in the fridge until dinner. An hour before you start prepping for the pizza, punch down the dough and knead it a couple times. Put it back in the bowl to rest at room temperature. When you're ready to start prepping the pizza, spread the dough out onto a well-greased 15 inch pan or pizza stone (preferred), using your fingers. Try to make the dough as thin as possible and push it all the way to the edges. Preheat your oven to 450F. Put one rack in the center of the oven and one on the lowest level possible. Slice one large russet potato, with the skin, very thin and uniformly. Roughly chop 6 cloves of garlic. Thinly slice one large portabella mushroom. Shred one half cup sharp cheddar and one quarter cup parmigiano-reggiano. 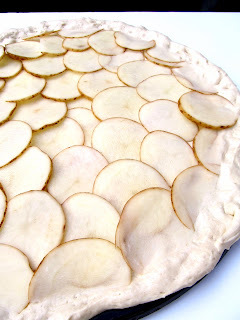 Lay out the potato slices on your unbaked crust, starting in the center and slightly overlapping as you go in a circle. Stop an inch before the edge. Lightly sprinkle with kosher salt and lots of black pepper. Shave a very small bit of freshly grated nutmeg over the potatoes (or none if you don't have fresh!). Drizzle heavy whipping cream to lightly cover most every inch of the potato slices. Sprinkle with the chopped garlic and all of the cheese. 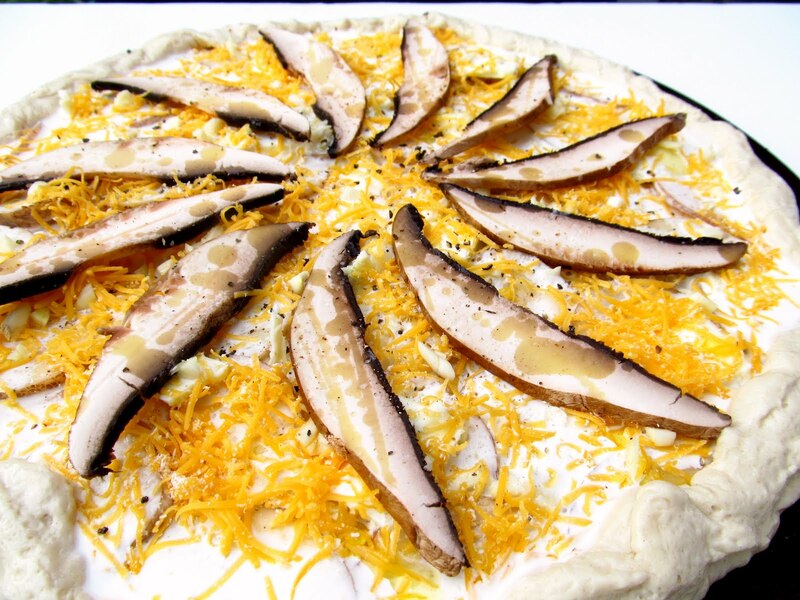 Lay the mushroom slices on the pizza in your desired pattern and sprinkle lightly with kosher salt again. Fold the inch of dough around the edge up and over the edge of the toppings. Drizzle the mushrooms lightly with olive oil. Bake for 25 minutes in the center of your oven. When it's golden brown, move to the bottom of the oven and finish baking until the under-side of the crust is well browned, up to 10 minutes more. If your cheese looks well browned before the crust is done, open your oven so the bottom heating element stays on continuously (if you have a standard electric oven). This will slow the cooking of the top and speed up the browning of the bottom. I like mine with one more sprinkle of salt and pepper, served along side a green salad. Eat warm and prepare to swoon. 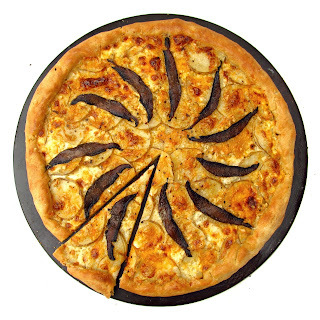 A gourmet pizza! 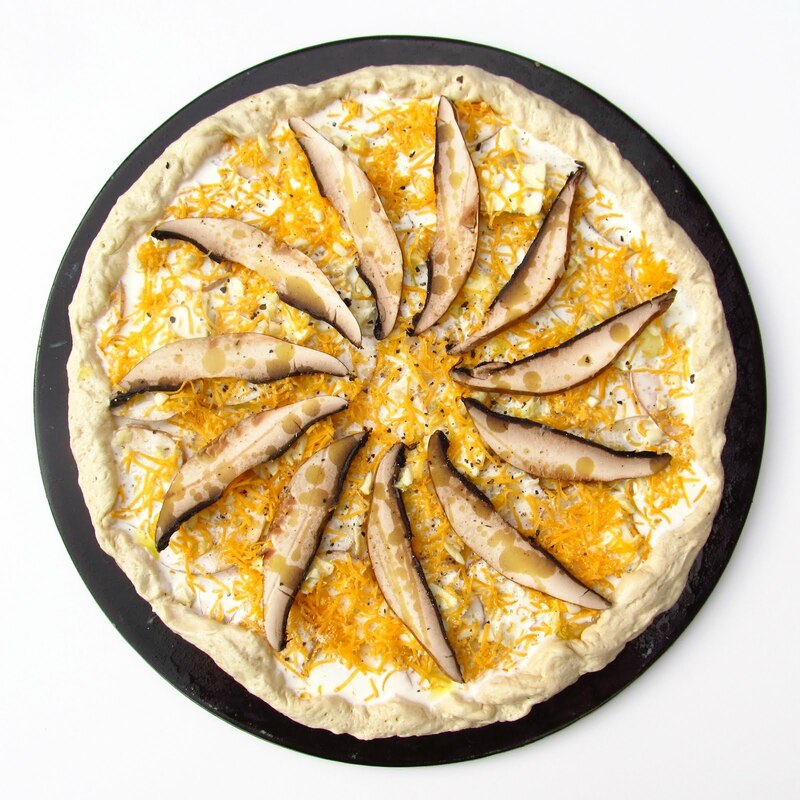 Love how you display the portabella topping. Wow! 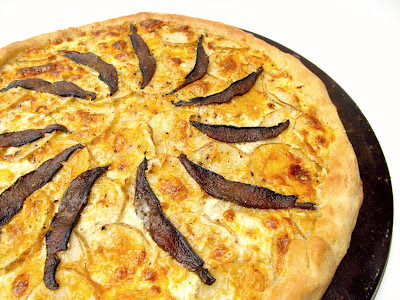 What a gorgeous pizza! I never had potato on pizza before. A definite must try! Never thought potatoes can be great pizza toppings. I love the amazing combination. Gotta give this a try!